Addition of aqueous acid to acetals will transform them back into aldehydes or ketones. This is often referred to as “deprotection” of aldehydes or ketones. 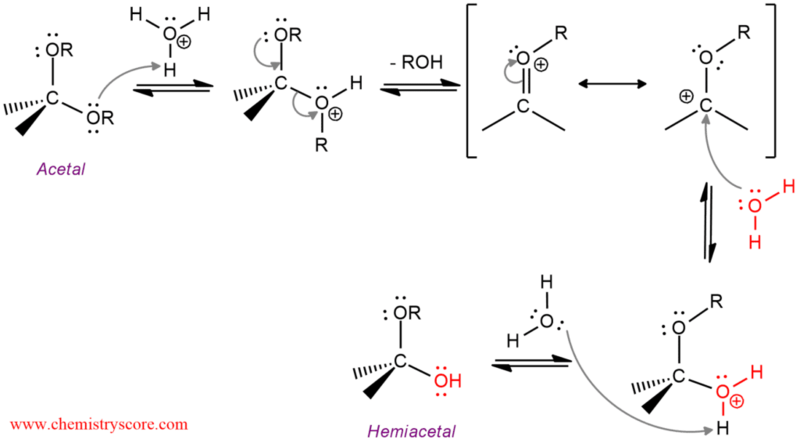 Hydrolysis of acetals is a reverse reaction of acetal formation. Acetals are stable under neutral or basic conditions but not in acidic conditions. In the presence of aqueous acid (e.g. H2SO4), they hydrolyze to starting carbonyl compounds. Protonation of OR group makes it a better leaving group. After the loss of the leaving group, the ion that is stabilized by the resonance is formed. Then water attacks carbocation to generate the oxonium ion which by deprotonation produces hemiacetal. In the next step, hemiacetal is subject to the same procedure as acetal. The OR group is protonated first and departure as a good leaving group. Then deprotonation of hydroxyl group generates a carbonyl compound (aldehyde or ketone).